Canada’s Prime Minister Justin Trudeau is in a tight spot as many world leaders in wake of the killing of Washington Post contributing columnist Jamal Khashoggi. It is evident that Khashoggi was murdered by a Saudi-sanctioned hit squad within the confines of the Saudi embassy in Istanbul. Turkey claims that there were 15 assailants including Saudi Arabia’s top forensic chief, a bone saw and a poor attempt at a body double. Of course, there are also the reports that an influential aide, to Saudi crown prince Mohammed bin Salman, told his men to dispose of Khashoggi and “Bring me the head of the dog.” Global condemnation has arisen. Trudeau is expected by Canadian voters to do something about the murder of Khashoggi, but the question is what? One of the possibilities is the cancellation of the $15 billion deal for 742 Light Armoured Vehicles (LAV 6), which was reduced from the original deal of 928 vehicles. The original contract also included 119 of the heavy assault variant that would be equipped with 105-millimetre cannons. The current numbers the assorted variants are not known, but the deal also includes a 14-year support contract. The deal came under media and public scrutiny in 2017 after a video purportedly showed Saudi security forces using older LAV-25s against Saudi Shia militants. The cancellation of the LAV-6 deal with Saudi Arabia would not be uncalled for. In light of the Khashoggi murder, Germany has taken the lead as Chancellor Angela Merkel announced a few days ago that the German government would not approve any new arms exports to Saudi Arabia. However, the key word there would be “new” as already signed contracts would continue. Merkel called upon Germany’s allies to join them in an arms export ban. Australia has also not ruled out an arms export ban to Saudi Arabia. Conservative, and Opposition Leader, Andrew Sheer has called for the ban of importing Saudi oil and also ducked the question of cancelling the LAV deal. Richard Masson, an executive fellow at the University of Calgary’s School of Public Policy, told the CBC that such an oil ban would lead to an additional cost at the refinery around a dollar barrel because approximately 40 per cent of the refinery’s oil mix is Saudi crude oil. A ban of Saudi crude would lead to additional price hikes at the gas pump as Canadians are already feeling the hit from Carbon Tax. This would not be a course of action that would be popular with the average Canadian voter. The truth of the matter is that it is doubtful that Trudeau will cancel the deal and that is because of the current state of Canadian politics and the economy. Now, if you are reading this and he has cancelled the deal – this will show why it was a bad decision for the Liberal Party. Trudeau has outlined that if the deal were to be cancelled it may cost the Canadian taxpayer 1 billion dollars in fines as per the stipulations of the contract that were negotiated and agreed by the previous government under Prime Minister Harper. If one does the math it does roughly equal 30 dollars per Canadian and that may seem worthwhile to the average Canadian citizen. However, next year is an election year. The cancellation of the deal would Canadian economy, potentially the job market in some areas, and overall to the Liberal Party’s electoral position. General Dynamics Land Systems (GDLS) already expressed its concerned about the possible loss of the contract in August when Saudi Arabia and Canada had a diplomatic, and sanctions, row. This row erupted after Canadian Foreign Affairs Minister Chrystia Freeland raised Saudi Arabia’s human rights record on Twitter. The cancellation of the contract would not only impact the jobs at GDLS’ plant in London, Ontario but also that the 500 suppliers for the LAV-6 which could also put future contracts in jeopardy. GDLS spokesperson Doug Wilson-Hodge told the CBC back in August that they export “90 per cent of its products, with the majority of current business dependent on Saudi Arabia.” The loss of such a contract would be an enormous loss to GLDS and its suppliers, but that also means the loss of more than 15 billion dollars in economic activity. The keyword term there is “economic activity” for those economic policy wonks. The initial 15 billion dollar deal would mean that GDLS’ employees and their suppliers would be paid, and their suppliers’ suppliers and employees would be paid and the various tax revenue that would be generated through those transactions. Economic activity means that the original contract amount is compounded through the subsequent transactions. The LAV contract is also very significant for GDLS. 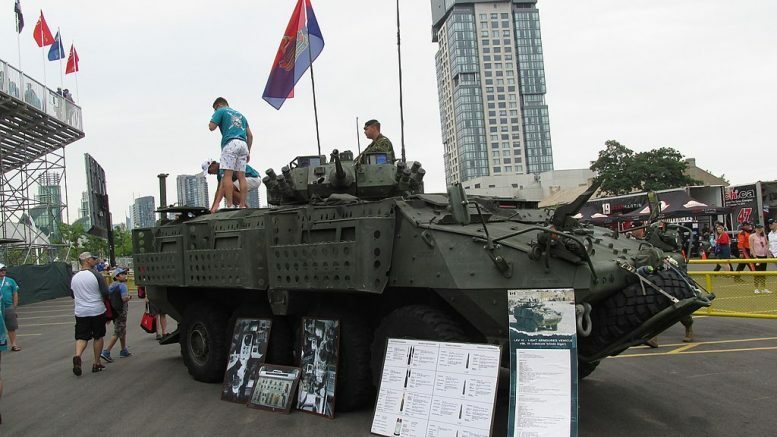 The previous Canadian government, under Prime Minister Harper, cancelled the 2.1 billion dollar Close Combat Vehicle contract which GDLS was a competitor for. The Stockholm International Peace Research Institute estimates that Canadian exports to Saudi Arabia between 2012-2017 equated to approximately 247 million dollars. This deal alone is approximately 30 times greater than the Canadian arms exports to Saudi Arabia in the past recorded five years. Obviously, this contract will be paid out throughout the deliveries and the 14-year supply contract, but it is still a significant boost. And the impact for GDLS is monumental as GDLS London plant is currently upgrading Canada’s 550 LAV-IIIs, however, the manufacture of a further 742 LAV-6s for the Saudi military would be a vital boost for the company. The cancellation of the LAV deal would also meet the ire and condemnation of Unifor, which represents the 470 unionized factory workers at General Dynamics Land Systems, in addition to that there are also the 1,500 non-unionized workers that would be affected. Unifor represents over 310,000 unionized members across the country and can be an influential political contributor. It also left the Canadian Labour Congress back in January to become more independent. Unifor can either be a significant ally or enemy in the upcoming election and the disruption of work in the London, Ontario region could also mean turbulent times for potential Liberal Members of Parliament in the upcoming electoral race. The Conservatives have not called for the cancellation of the LAV contract, but the New Democratic Party’s new leader Jagmeet Singh has called for the ban. This undoubtedly will cause waves with Unifor’s historical support with the NDP. Moreover, the Liberals are historically strong in the London, Ontario region, but not for the past couple of elections. A cancellation of the deal would further embolden the hold that the Conservatives have had, which explains why Sheer ducked the question by offering another policy idea. But a delay in the contract, and not a cancellation, may take support from the NDP and help bolster the Liberal vote share in the region and may maintain the majority that the Liberal Party enjoys today. The 2015 election saw the Liberals win 184 seats (up 148 from the previous election) and the Conservatives won 99 seats (down 60). Recent polls show a 10-point lead for the Liberals, but the election is a year out and battle ridings are going to be fought for. Prime Minister Trudeau already hinted at his government’s course of action – the freezing of export licenses to Saudi Arabia. It would not be the cancellation of the project, just a mere delay – and it would also mean a minor delay to the economic boost that this deal would represent. The only issue for the Trudeau government would be unfreezing of the licenses before the election. Deliveries of the first vehicles were slated to be in early 2017 and due to the secretive nature of the contract – the number of vehicles already exported are unknown. So, if there were to be a freeze in the export of the LAVs to Saudi Arabia – don’t expect it to last long and probably just long enough for the murder of Khashoggi to be flushed from the news cycle.